This is your ticket to a Denver adventure! Any Arapahoe Libraries card holder can reserve passes to metro-Denver attractions including the Denver Museum of Nature & Science, Butterfly Pavilion, Wings Over the Rockies Air & Space Museum and more, at no charge. Book passes up to 30 days ahead of time. Maximum of two passes booked at one time. Need help booking or cancelling passes? Call 303-LIBRARY (303-542-7279). Check out an adventure backpack that includes a free state parks pass! 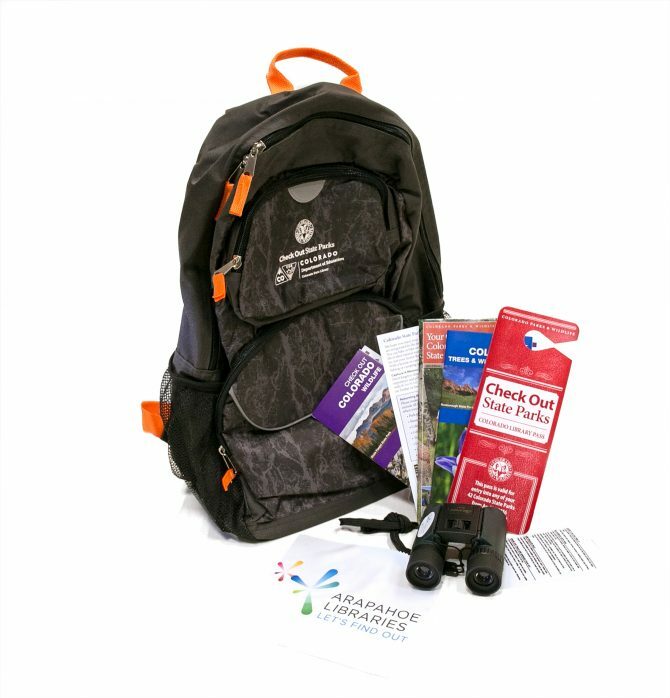 This kit can be checked out for one week and grants access to any Colorado State Park. See the complete list of Colorado State Parksopens a new window, and put a hold on a Check Out State Parks Pass today! How many people does an Exploration Pass admit? How many Exploration Passes can I reserve? How far in advance can I reserve an Exploration Pass?